and her grandchildren with a servant (possibly William Lee), 1796.
now Pennsylvania Avenue, on the map of the District of Columbia. Engraving by Edward Savage, 1798, after his 1796 painting. 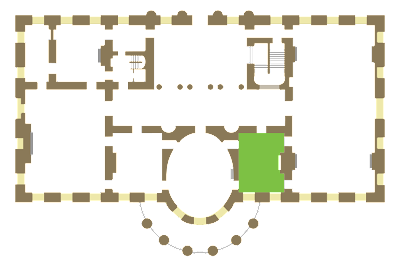 First Floor Plan of the White House indicating the location of the Green Room. 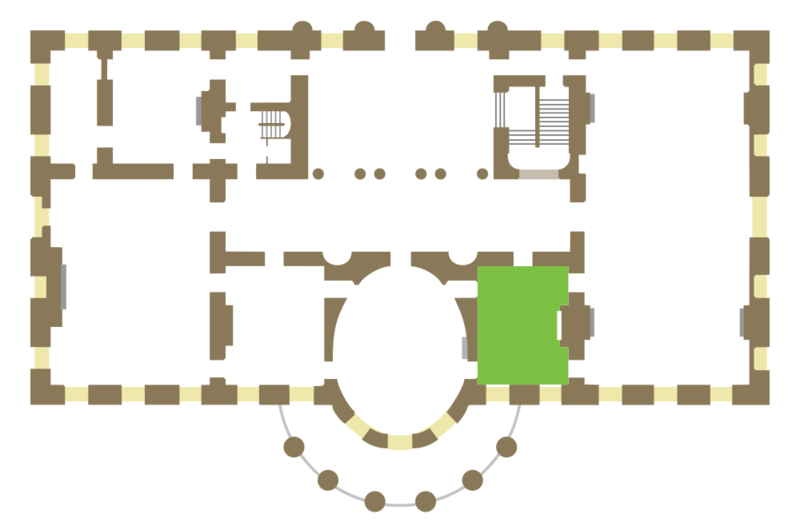 (The adjacent oval room is known as the Blue Room and the largest room is the East Room). This is the second of a series about the decoration of the Green Room of the White House. The first essay presented the 2007 refurbishment undertaken with the leadership of First Lady Laura Bush and may be viewed here. Some background on the history of the room is helpful in understanding the whole topic of interior design in the White House, so bear with me for an abbreviated survey. 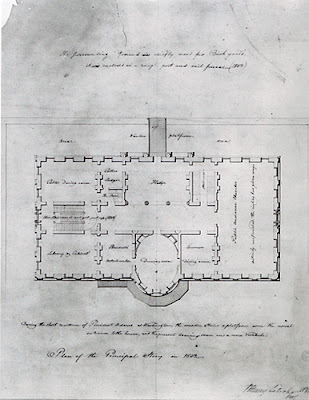 indicating how Thomas Jefferson used the rooms in 1803. Architect James Hoban intended this room, 22'-6" x 28'-3" with a ceiling height of 18', as the "Common Dining Room" (meaning everyday). The first occupants, John and Abagail Adams lived there only a short time (because the capital was in Philadelphia before Washington became the official federal city), although the February, 1801 inventory lists it as the "Lodging Room". 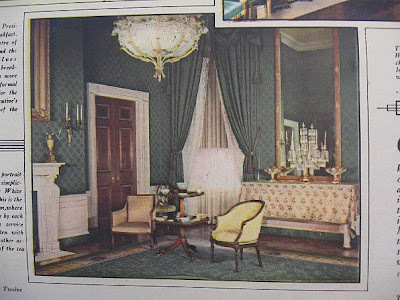 The White House's second occupant, Thomas Jefferson, used it as his dining room and we know that it was furnished with chintz curtains and a painted green floor cloth. James and Dolley Madison used it as a sitting room and James Monroe used it as a card room. 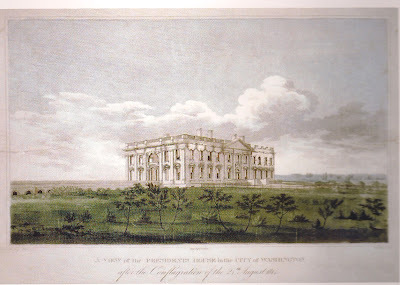 The White House after the 1814 fire as seen in an aquatint by William Strickland. The bold door and window trim with ornately carved corner blocks came from the Monroe redecoration of the State Rooms after the August 24, 1814, British burning of the White House as did the white marble chimneypieces ordered from Italy. 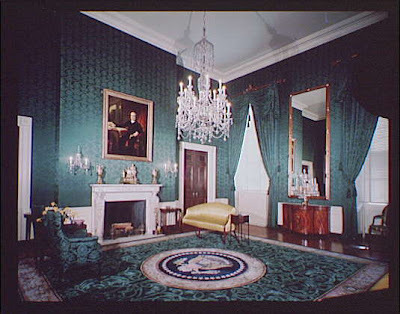 Although some sources say that the Monroes were the first to refer to the Green Room by that name, others say that it was not until John Quincy Adams presidency that it became universally known as the Green Room because of the fabrics used. 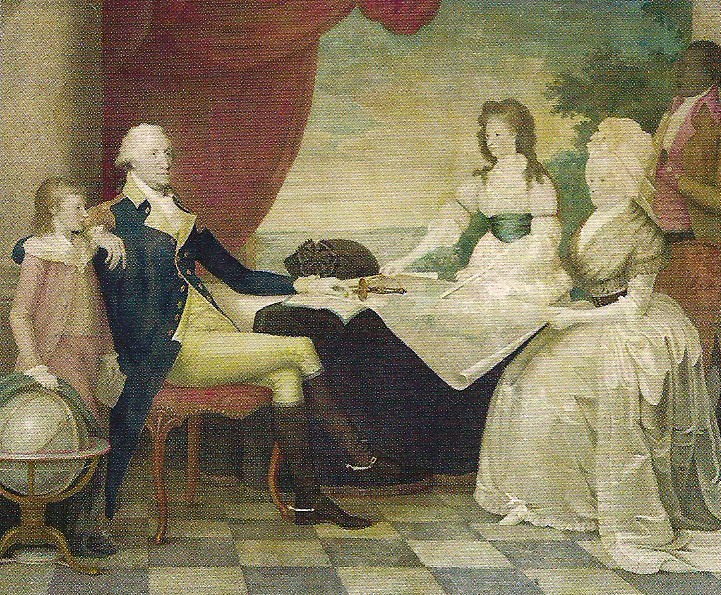 (As a consequence of Monroe's purchase of mostly imported French furniture, Congress inacted legislation that required furniture bought for the White House with public funds must be of domestic origin. Adams commissioned local cabinetmakers, including M. Bouvier, great-grandfather of future First Lady Jacqueline Kennedy, to create quality furniture for the White House). in 1834 during the Presidency of Andrew Jackson. 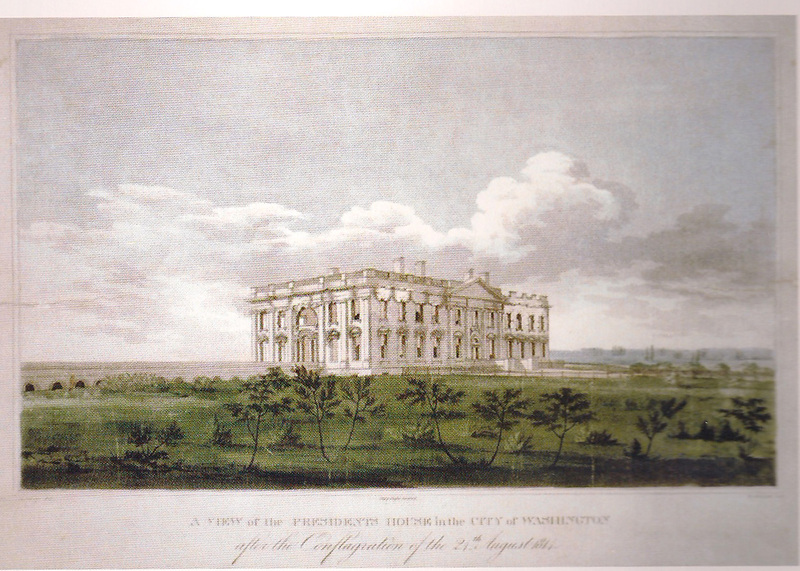 Image from DREAM HOUSE, THE WHITE HOUSE AS AN AMERICAN HOME. Andrew Jackson was the first president to undertake a full interior decoration of the White House, partially necessitated by the throngs that attended the 1829 inagural reception, all supplied by Philadelphia furnisher Louis Vernon. 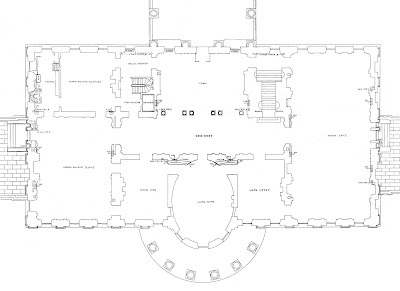 Because of its location adjacent to the East Room, the Green Room was used as a reception room. It was at this time that advances in lighting and chemical dyes that allowed the rooms to be more colorful and brighter than ever before. (Jackson also installed running water). In the North especially, there was a mid-19th century movement that regarded Greco-Roman classicism as un-Christian and completely adverse to American values, but the White House remained white (at least on the exterior) and the interiors restrained. 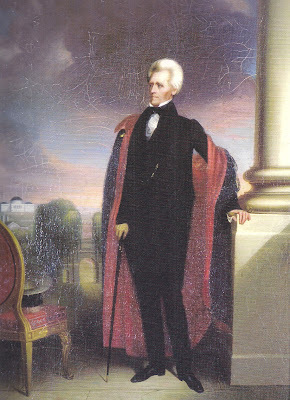 President Andrew Jackson by Ralph E.W. 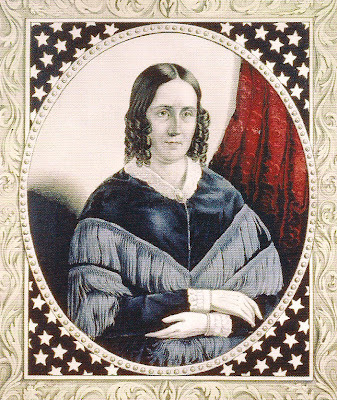 Earl, 1836. There was little variation to the Jackson scheme by the Van Burens, Harrisons (who lived in the White House only a month until the President died of pneumonia), and Tylers regardless of the needs caused by wear. But despite criticism that he and his wife lived regally, which some contribute to his loss of the 1840 election, Van Buren did provide a new suite of all-upholstered furniture for the Green Room that was known as confortables, utilizing coiled steel springs and heavy padding for comfort. after an 1846 daguerrotype by John Plumbe, Jr.
With the 1845 occupancy of James K. and Sarah Polk, a luxurious elegance came to the White House interiors with the help of Washington art collector W.W. Corcoran. Although no images exist, we know the Green Room had green curtains and upholstery, with a ruby red carpet with a design of eagles and stars. (The Devoted Classicist has a special interest in the Polks, so you will be reading more about them in future posts). 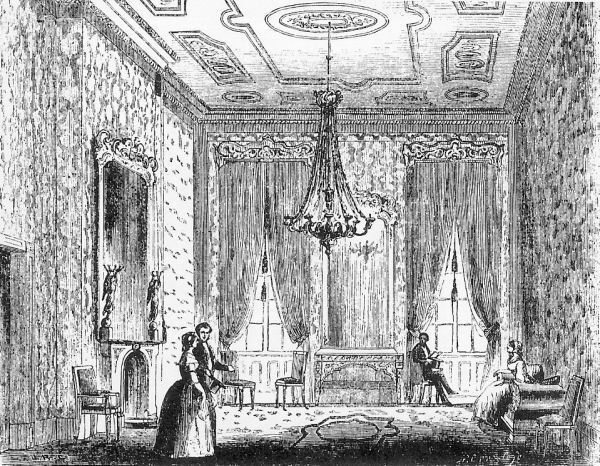 The Green Room in the 1850s during the Pierce occupancy. Image: White House Museum Organization. 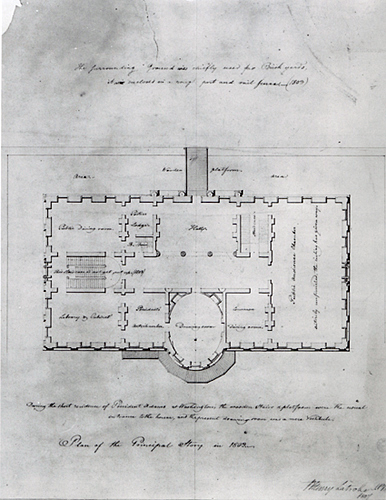 In addition to new bathrooms and heating introduced to the White House with the help of architect Thomas U.Walter, Franklin and Jane Pierce replaced the classical chimneypieces in the Green Room (along with the Red, Blue, and East Rooms) with Roco style white marble chimneypieces with arched openings fitted with coal grates. 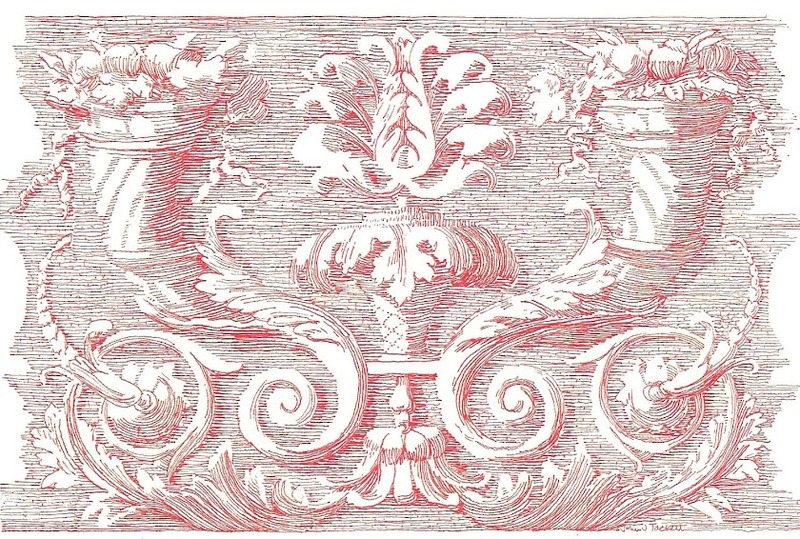 Painted decorations in a large scale French design was added to the ceilings of the all the State Rooms. New wallpaper with a green design against a white background and a coordinating fitted carpet completed the new decor for the Green Room, reflected in a large gilt overmantel mirror supplied by L.R. Menger of New York. The 1860 visit by Edward, Prince of Wales, who was the first member of the British royal family to be received by a President, prompted a renewal of fabrics and carpets for the bachelor President James Buchanan, overseen by his niece, Harriet Lane. by the Lincoln White House Community. The over-spending of the White House decorating budget by Mary Todd Lincoln is well-documented, with the State Rooms getting French wallpapers, lace curtains, furniture, and new carpets from William Carryl in Philadelphia and A.T. Stewart in New York. (Stewart's is considered the first department store in America). After the 1862 death of Willie Lincoln from Typhoid Fever, his open casket was placed in the Green Room; according to accounts of the time, Mrs. Lincoln never entered the room again. 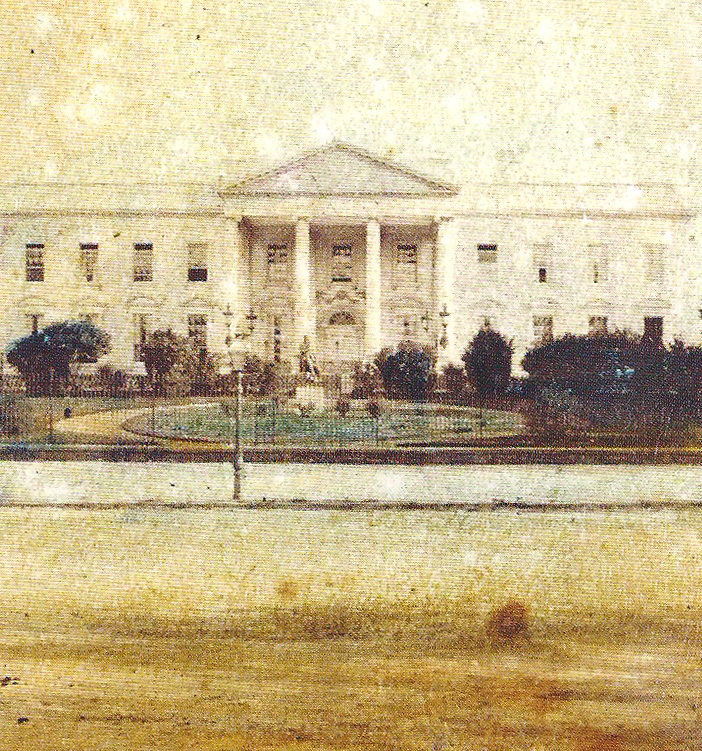 The North Front of the White House, as it appeared about 1865.
was one of the few statues ever on display in the garden. 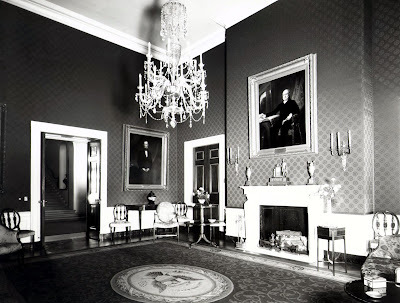 Following Lincoln's assasination in 1865, the White House interiors of Andrew Johnson had been tattered by souvenir hunters taking pieces of curtain trimming, upholstery fabric and carpeting. The Johnson's daughter, Martha Patterson, undertook the redoration of the State Parlors with Neo-Grec wallpaper and Pompeian-red banding and black & gold borders, thanks to appropriations that totalled more than $135,000 by the end of his term in 1869.
of the Green Room photographed, 1875-80, during the Grant presidency. Philadelphia, is still in place. but may be a photograph from the Grant era. however, because of the tatered upholstered fabric. on horseback leaning against the wall. Photo: White House Historical Association. President Grant was not interested in interior aesthetics despite that America was poised to enter the Gilded Age at the time of his 1865 inauguration. (He did oversee the extensive landscape improvements of the grounds, however). Julia Grant essentially left the Green Room as she found it (although she changed the Blue Room and the East Room). 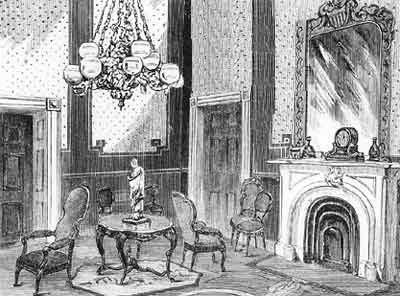 Neither Lucy Hayes nor Lucretia Garfield had the opportunity to make many changes in White House decor. But the Garfields did have the Washington furnishers W.B. 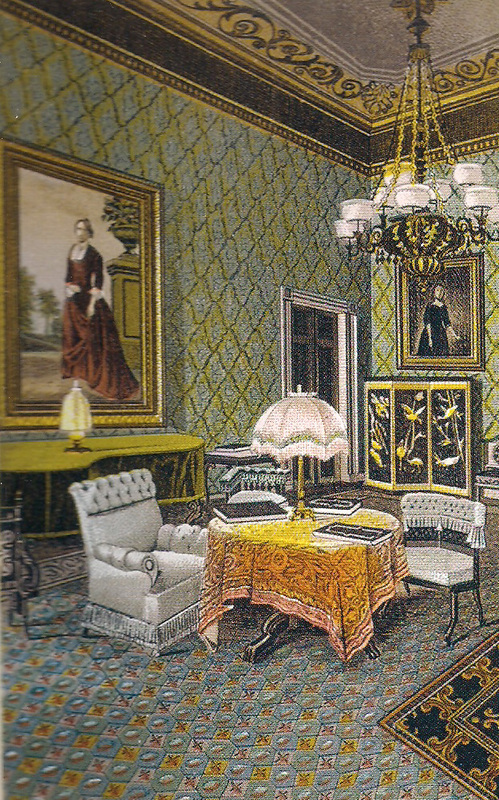 Moses & Sons supply the Green Room with ready-made Aesthetic style upholstered furniture and curtains in the same fabric; the 1850s gasolier and over-mantle mirror remained. The Garfield Green Room, 1800-85. 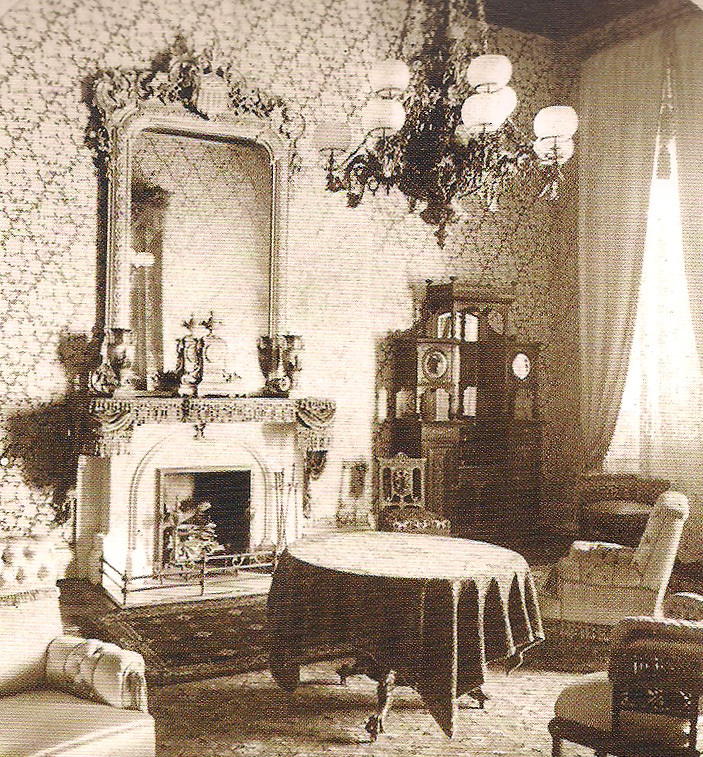 Chester Arthur was widowed and one of the few presidents to have significant input for the White House decor. As a New Yorker who was familiar with the Gilded Age mansions, Arthur brought in Louis Comfort Tiffany, sometimes considered the first professional American decorator. Tiffany's work in the White House in 1882 provided entirely custom, luxurious interiors, not purchased from a department store. But Tiffany did not change the Green Room although some Tiffany pieces eventually made their way into the room. in a photo lithograph showing the colors typical of the period. 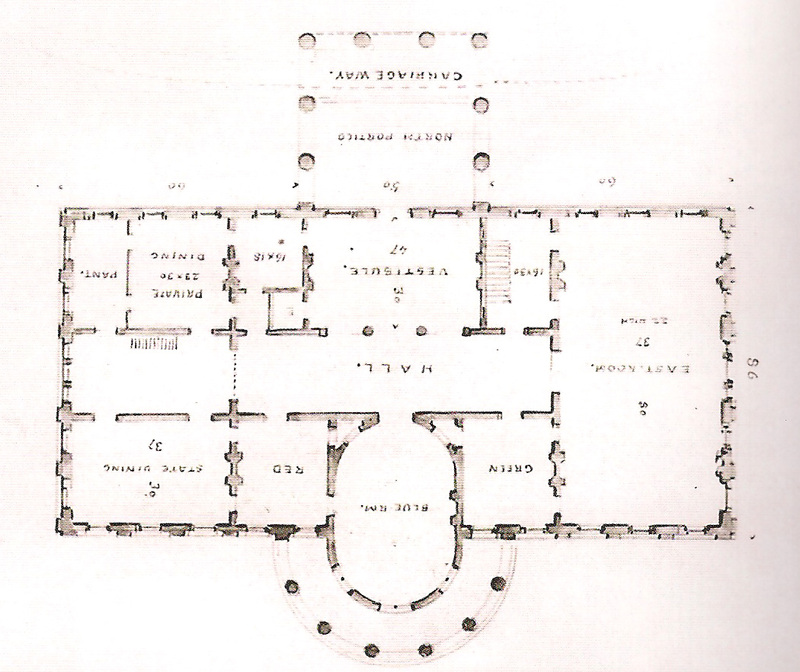 The First Floor Plan after the McKim, Mead & White renovation of 1902.
to both the Green Room and Red Room for circulation during events. there are removable panels that are usually left in storage today. 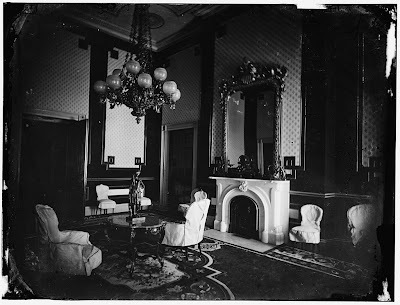 The Theodore Roosevelt Green Room, circa 1903. Typical of the taste of Stanford White, the walls and curtains of the Green Room were of the same green velvet, said to be copied from a Genoese fragment. White neo-classical furniture from A.H. Davenport & Company, Boston, was upholstered in a tapestry fabric that coordinated with the modern rug on the new parquet wood floor. 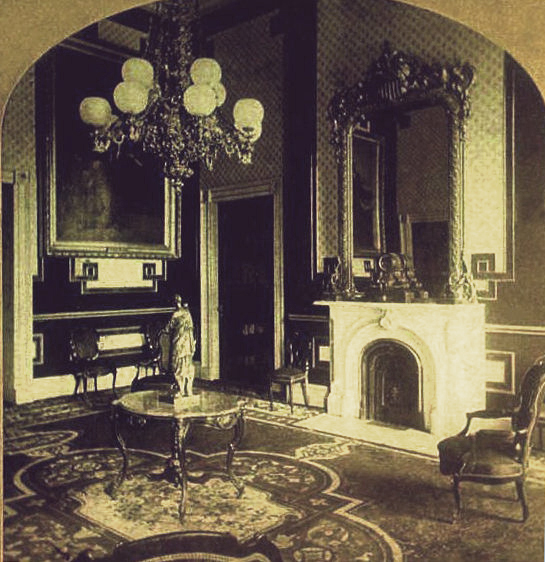 One of the Monroe-era marble chimneypieces from the State Dining Room was installed (with the other going to the Red Room). And a new crystal chandelier that was a stylistic reinterpretation rather than a reproduction provided electric light. The marble center table dates from Mrs. Tyler in the 1840s. The Viennese fire screen had been presented to Grant after the 1876 Centennial Exposition. Neither Helen Taft nor Edith Wilson made any dramatic changes in the State Rooms, but Edith Wilson was the first to have American porcelain dinnerware, Lenox China, made in Trenton, New Jersey. 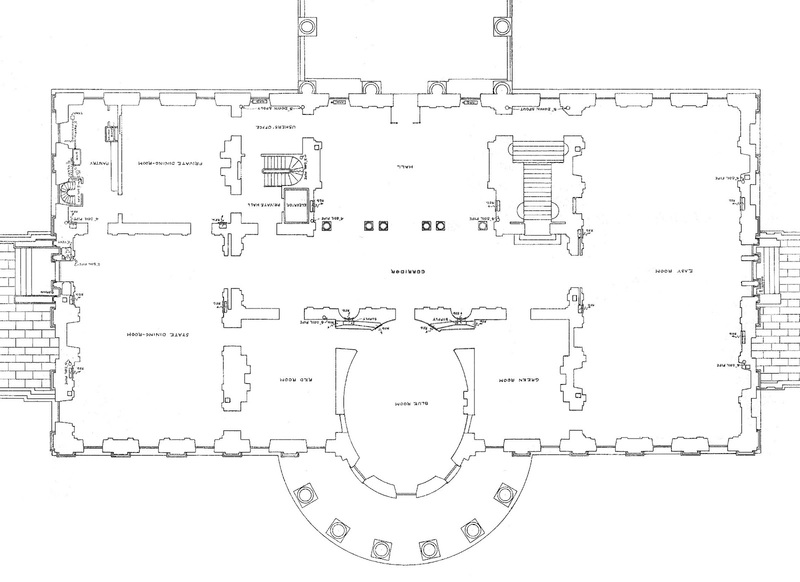 In 1909, President William Howard Taft began plans to increase the size of the White House by 80%, adding the Oval Office and other spaces designed by Nathan C. Wyeth to further allow the State Rooms to be used for ceremonial functions. the scheme developed by Crace Cooldige and her team. The Hoover Green Room kept the Coolidge decoration. Eleanor and Franklin D. Roosevelt spent nothing on the State Room interiors during the decades of economic depression and war. The installation of ductwork for central air-conditioning was one of the many alterations that led to problems, however. 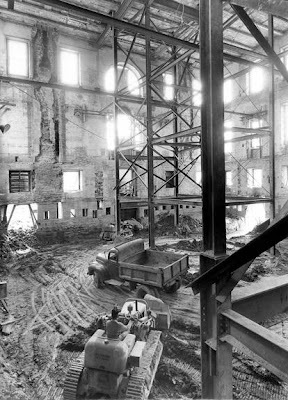 The interior of the White House during the 1949-52 rebuilding. 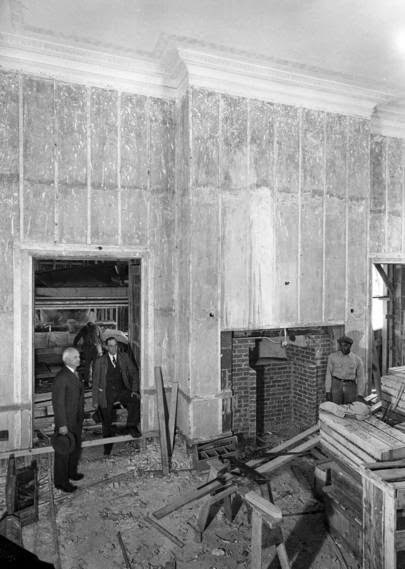 After years of assorted and miscellaneous renovations, the White House was in poor structural condition by the time of President Harry S. Truman. A rebuilding of the White House began in 1949 and continued to 1952 with most of the house stripped down to the stone walls. renovation as seen on May 21, 1951. The Truman Green Room in 1946. 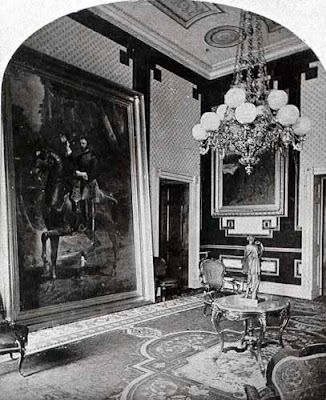 The Green Room was the only State Room to be refurbished before the renovation. The fabric was a bright reinterpretation of an 18th century damask selected by Charles T. Haight, chief decorator for the New York department store, B. Altman & Company. After the renovation, the same selection was used again. The Truman Green Room in 1952. Photo: Abbie Rowe, Truman Library. The Eisenhower Green Room in 1960. 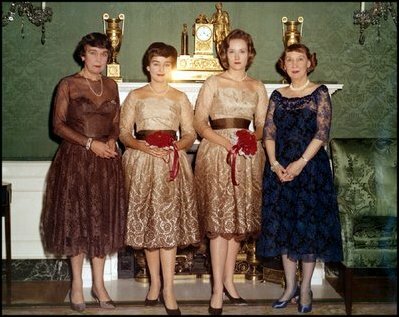 First Lady Mamie Eisenhower, right, with her sister and two nieces. 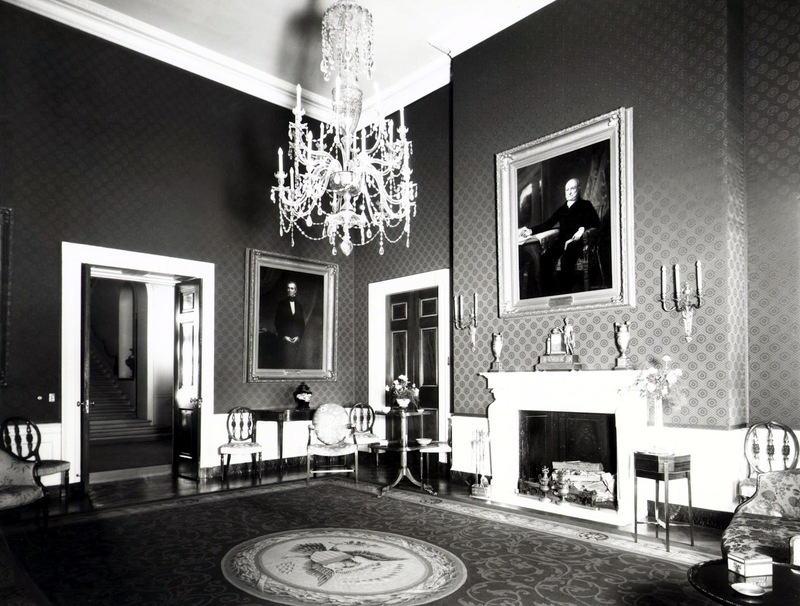 Dwight and Mamie Eisenhower made no significant changes to the State Rooms of the Truman White House. In 1956, a longtime friend of the Eisenhowers, Margaret Thompson Biddle, donated her collection of European gilded silver to the White House, leading to the creation of the Vermeil Room in the basement level. (Coincidently, Mrs. Biddle's villa on the Riviera was decorated by Stephane Boudin who would later redecorate the Vermeil Room during the Kennedy era). 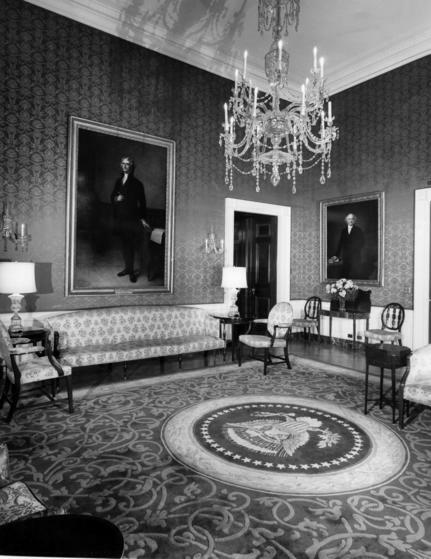 In 1960, the basement oval room, a secondary reception room, was redecorated through a collaboration of the National Society of Interior Designers and Mrs. Eisenhower, furnished with donated Federal period antiques. But the White House was treated foremost as a residence and it was secondary that it was a historic building. It was not until the next First Lady that the White House was considered also as a museum. just prior to the Kennedy inaguaration. 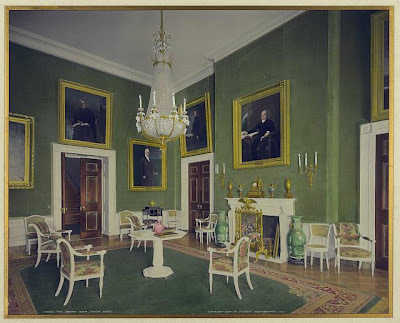 The next post of The Devoted Classicist will present the Green Room decoration by the team led by Jacqueline Bouvier Kennedy, who set a standard by which White House interior design is still measured today. More about the White House as a residence and how it compares to other architecturally significant homes can be found in an interesting book written by acquaintances Ulysses G. Dietz and Sam Watters, DREAM HOUSE: THE WHITE HOUSE AS AN AMERICAN HOME. It is available for purchase at a discount here. It is fascinating to me that every generation has its own aesthetic preferences AND also its own theory base. The mid-19th century movement that regarded Greco-Roman classicism as un-Christian and unAmerican in its values sounds somewhat bizarre, but it made perfect sense. 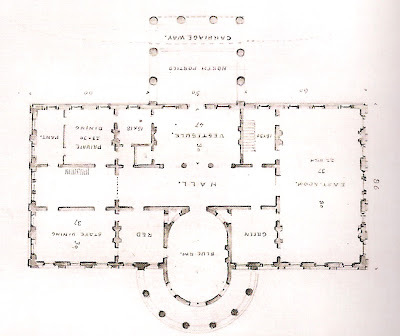 And as a result the White House remained one colour and the interiors restrained. Hels, of course Gothic Revival and other romantic and picturesque styles enjoyed a popularity in the American South, but the appreciation for white columns and pillars endured, along with philosophy behind them. Reggie, I understand your appreciation of the T.Roosevelt-S. White decoration. The marble center table with a suite of painted neo-classical armchairs overseen by big Presidential portraits is a handsome scheme for a reception room. The rug seems to be a bit problematic in every case. I would like to see the curtains. I'm another fan of the TR scheme. I've always found it amusing that the same rugged man's man that filled the baronial State Dining Room with his mounted trophy kills turned around & approved such a genteel, almost ladylike scheme for the Green Room. Maybe it's part of that whole aesthetic balance thing again: this is the fruit sorbet course after the heavily-sauced roast venison down the hall. I also sort of like the Greenery-Yallery 1880s version of the room. At this point, that decor is historic in its own right, and it's also one of the few styles that--so far--has never been revived at the White House, so maybe its time for a whole new approach. Since Change is, alledgedly, good, a total change in direction for the room (rather than a narrow, targeted change) might be the most tactful way of getting rid of the room's current rug. S.G., thank you for commenting. I get the idea that the Theodore Roosevelt Green Room was more Stanford White and Edith Roosevelt than Teddy, given the absence of taxidermy. Although an increasing appreciation of the Aesthetic Movement might lead to a revival expressed in decoration, the nod to Victoriana by Little Rock decorator Kaki Hockersmith during the Clinton era and the subsequent reaction may delay that for a while. A fascinating article on my favorite White House room. While I would not have placed white furniture in the Green Room, I'm partial to the simplicity of the Roosevelt version, so modern for its time. I have a National Geographic article on a tour of the White House with Mamie Eisenhower, and all the public spaces look like hotel rooms. Other than paintings and a few good pieces of furniture, there weren't many antiques. Mark, thanks for pointing out that the Roosevelt Green Room was indeed very modern for the time; I am a big fan of painted neo-classical furniture, so this was right up my alley. Mamie Eisenhower thought the hotel decor was perfect for the White House and I don't think she ever understood the changes of Jackie Kennedy. But I'm getting ahead of myself. I appreciate your comments. The White House is an interesting mansion, looking forward to more posts about it. Another vote for Roosevelt and Kennedy. I miss the simpler elegance. The Federal-Style-on-Steroids decor of the present version just hurts my teeth, especially the pelmets and valances. 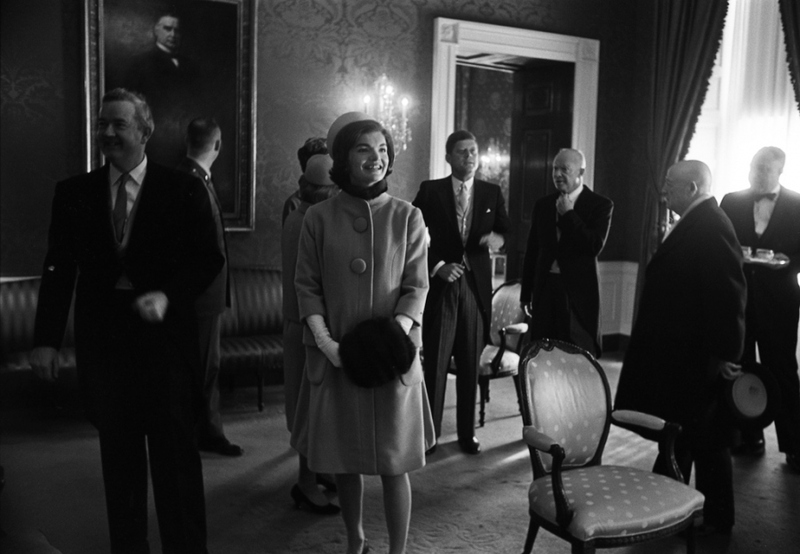 The photo of Mrs. Kennedy in 1961 show her in the Red Room - not the green room. J.M., looking more closely at the fabric wall covering, I think you are correct. I will edit the caption. Thank you for your correction.